The International Encyclopedia of Human Geography provides an authoritative and comprehensive source of information on the discipline of human geography and its constituent, and related, subject areas. The encyclopedia includes over 1,000 detailed entries on philosophy and theory, key concepts, methods and practices, biographies of notable geographers, and geographical thought and praxis in different parts of the world. This groundbreaking project covers every field of human geography and the discipline’s relationships to other disciplines, and is global in scope, involving an international set of contributors. 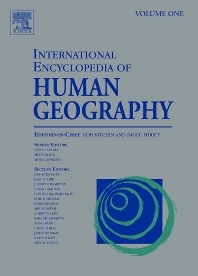 Given its broad, inclusive scope and unique online accessibility, it is anticipated that the International Encyclopedia of Human Geography will become the major reference work for the discipline over the coming decades. Readers will include undergraduate and postgraduate students, researchers, teachers and lecturers, and professionals. Director of NIRSA, National University of Ireland, Maynooth, Ireland. "[The encyclopedia] strives to live up to its name with 844 contributors representing over 40 countries…, it covers both theoretical and applied aspects. At the same time , it is slated to reflect the changing nature of the discipline itself. Future plans for this resource to be continually updated to trace developing scholarship. By retaining all entries, the encyclopedia will become a record of the course of the discipline itself… Given its scope and overall coverage, and its projected ever-current status (as of the next edition), this is a groundbreaking project that will be the standard for the field—potentially for generations… Highly recommended." --CHOICE The review also includes mention of the various search capabilities available on ScienceDirect.